When September peeks around the corner and the sweet spice of autumn sparkles in the air, I know that it is time to cut back my dahlias, put in my marigolds, and start the watercress and the swiss chard planting. Winter planting, unlike spring planting where anything grows, is decidedly targeted at a grouping of hardy winter plants that can withstand the colder temperatures and the shorter daylight. This year, for my winter planting, I am getting a planter box built for me by my very own cabana boy! He’s a sweetheart. My request was simple but there were a few very specific requirements that he had to meet. First, I needed a planter box that would be tall enough to keep the dogs from trampling over my new seedlings and any vegetables that I can manage to coax out of the ground with my severely limited gardening skills. My second criteria had to do with the size and shape of the planter box. I didn’t have a lot of space and could only allot a small corner next to the wall, so the box had to be custom-built to the specifications of the size given. Finally, I wanted the planter box to be durable because I knew that when the moist dirt becomes compacted and the box gets filled with plants, the weight of the contents could cause the box to fall apart, especially since I had the tendency to clamber all over the place to do my planting. The box is roughly 31″x24″x28″. I say roughly because it is not a square box, and no, it was not a design flaw or accident. It was built specifically to fit an oddly shaped corner that only allows for a trapezoid-shaped object of a certain dimension, and it was the single determining factor of the size and shape of the box. The materials used for the making of the box were unique and interesting because I wanted something that was NEVER going to rot and did not clash with its surroundings. That’s a tall order, especially since wood would have been the most obvious choice of material to use. Unfortunately, with all the watering that a planter box tends to get, it would have rotted after a few seasons of being in the sun and soaked with water every day. The only thing that would withstand that kind of weathering and abuse would have been manufactured materials. Since the deck is made from Trex, a type of composite material made from recycled plastic shopping bags and the likes, the perfect material to use for the box was the left-over Trex planks that had been languishing in a corner of the yard, awaiting further instructions as to their final fate. My new planter box would be comprised of Trex planks, held together at the corners by 4×4 pressure-treated lumber. Now, let me hasten to add that this was no sixty-minute chop-shop job. The box was crafted entirely by hand, without any instruction manual or glue tubes . There were little to no power tools used because the fittings were done in a tongue-and-groove fashion, which required careful hand-chiseling to assure proper alignment of the planks to the wood posts. Four-inch screws were then used to hold the whole thing together. I must admit, if I had done it myself, it would have been a hack-job at best. This was the first time I had ever seen a real wood craftsman work on something from scratch. This was not prefabricated pieces bought in a store and pieced together with an allen wrench. After the planks had been fashioned and tongued, they were fitted into the grooves carved from the post, and were then ready to be lowered into place. The ground was leveled and the box was put in place. Since this box does not have a bottom, when the plants are in place, they will be free to put down roots straight into the ground. This helps, not only with drainage issues but also with plant health. With deep roots, plants have a better chance of thriving and regrowing in the spring. To start the garden, I put the marigolds into the box to give some autumn color, but once the swiss chard sprouts have grown large enough to transplant, they will go into the box and hopefully, I will have fresh greens to eat all winter long. The end result is this–a planter box, situated in a tight corner that cannot be used for much of anything due to the pond’s unique location and shape. Next, we filled the box with the necessary ingredients for plants to thrive. Since the box’s dimensions require at least 6 cubic feet of fill, we got one cubic foot of sand, three cubic feet of planting dirt, and two cubic feet of steer manure (what’s your problem, it’s organic). The sand goes in first to provide adequate drainage. Since the box has no bottom, excess water will be able to filter through and sink into the ground instead of staying in the box and drowning the roots. One cubic foot of sand is enough for this box. Next, we put in three cubic feet of gardening dirt. Since the bags are too heavy for me to lift, of course, my cabana boy did all the heavy work. I quite enjoyed the sight of a man hauling bags of dirt and then dumping them into the box. It makes me appreciate what a male body can do given the right incentives. He emptied the bags on top of the sand and then smoothed it over without mixing the sand and dirt together. In effect, we had two separate layers, one of sand, the other of dirt. 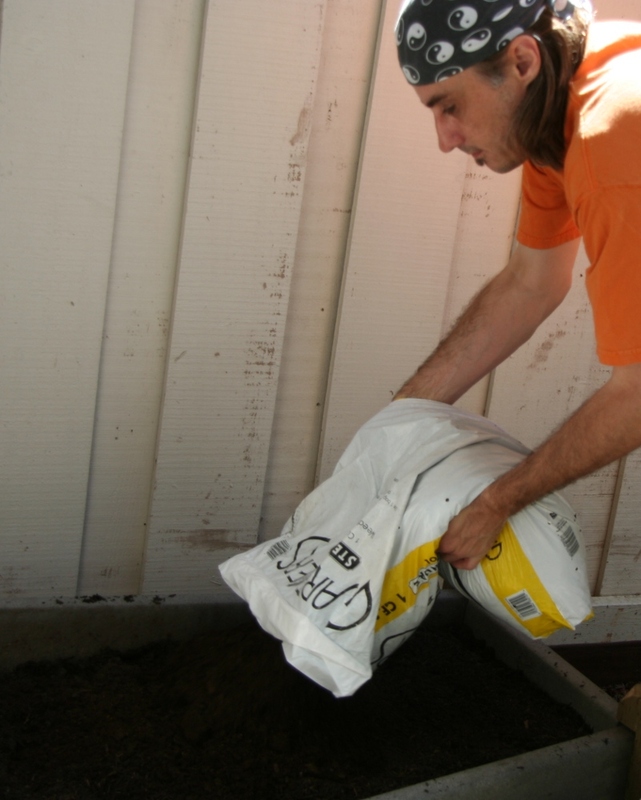 Next, we put two bags of steer manure into the box and used a hoe to mix it up with the dirt. I have to admit, at this point, the garden really smelled to high heavens. However, being the Taobabe-Gardener-Wannabe that I am, I sucked it up and did my best to get used to the less-than-delicate scent of warm moist cow poop being spread about as if it was black gold dust. The box was now ready for me to put my plants in. Here I am, getting the marigolds and the daisies ready to be transplanted from the pots, into the planter box. Tall plants go in the back, short plants in the front. At least, that’s the general idea. How tall they decide to grow is up to them. In my garden, the dahlia is the tallest plant I have, so I decided to stick her in the back. I hope she gets enough sun. Next, we have the marigolds. They go in the front. And the final result is a wonderfully harmonious box, taking up what would have been an awkward shape in the corner of my delightful garden. Somehow I don’t think my dear wife would be too keen on that idea. Those classified wanted ads can sometimes yield tiny overlooked treasures. My cabana boy has three little surprise letters after his name; PhD.